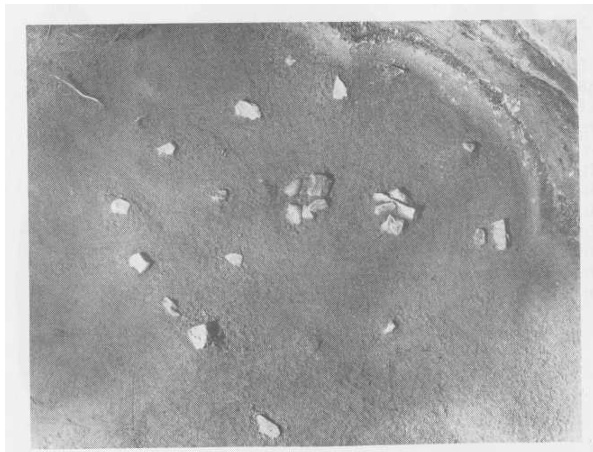 An ancient petroform, or formation of stones from 500BC was uncovered at Constance Bay in 1970. When you think of Ottawa history, you probably think of the early 1800’s, the days when logging was a booming industry and the Rideau canal was being constructed. While most of Ottawa’s history is relegated to only the last 200 years, there is a relatively unknown history to this region that far surpasses that timeline by thousands of years. A history that includes an ancient civilization that flourished along the shores of the Ottawa River. Remnants of their existence are still out there waiting to be found. Objects used by this civilization represent a fascinating and overlooked part of our area’s rich and unexplored history. Ancient pots have been found just sitting in the crevices of Luskville cliffs, forged copper weapons from 6,000 years ago have been found on an Ottawa River island near Pembroke. Area artifacts slowly being uncovered show a vast ancient trade network with distant regions that seem weirdly unlikely. Exotic materials in these objects show them originating from as far away as the tip of Labrador and the far reaches of a Lake Superior island where an ancient copper mine produced 99% pure copper to a widespread group of ancient civilizations in the Americas. A 2,000 year old knife found near Ottawa was was made from a type of stone only found in Ohio, USA. Granted, the Ottawa area provides water access to a variety of areas through the Rideau river, the St. Lawrence, the Great Lakes and beyond. Likewise, visitors from those places could have visited the Ottawa area. 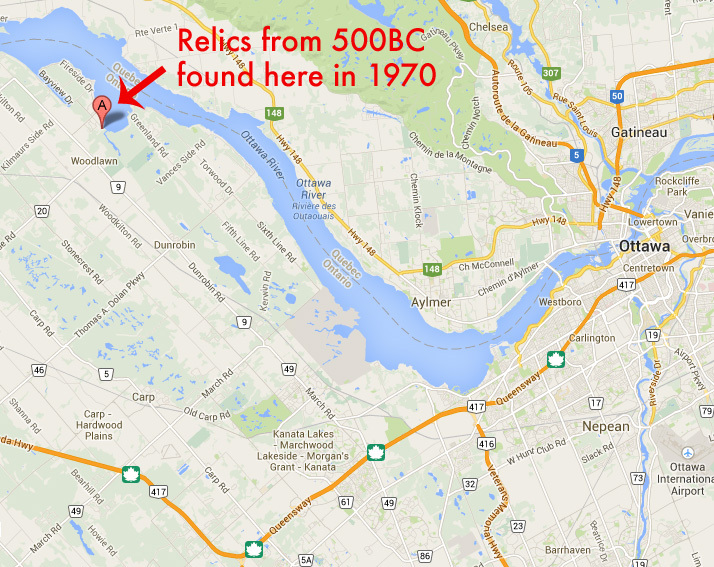 One such example of this ancient past is the the accidental discovery of relics from the period of 500BC during the summer of 1969 near Constance Bay. Yes, 500BC…2,500 years ago. It happened when a cottage was being built on the shores of the Ottawa River, unearthing objects that led to an archeological excavation in 1970. I came across the original archeology report of this ancient find and what it revealed is a unique and compelling history of our area. You can read the entire 1970 archeological report on this extraordinary find here. 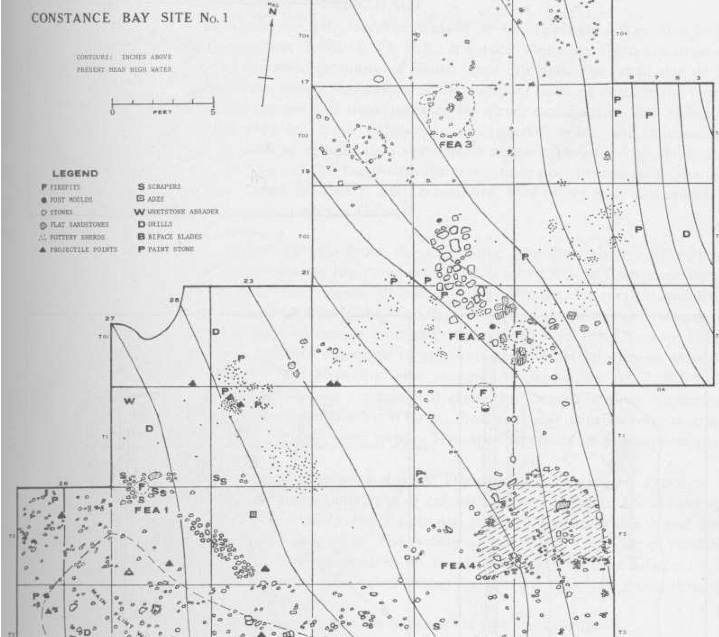 The original 1970 archeological sketch of the Constance Bay site. A sample of the items recovered from the site. The ensuing dig in 1970 produced ceramics, stone tools, fragments of copper, galena, mica and bone, hearth features, and an apparent red-ochre burial site marked by a possible petroform (arranged stone formation). The radiocarbon dating of charcoal found at the site place the site and its relics around 490 B.C. ± 75 , when Middle Woodland tribes were congregating along the waterways of what is now Ontario and Quebec. 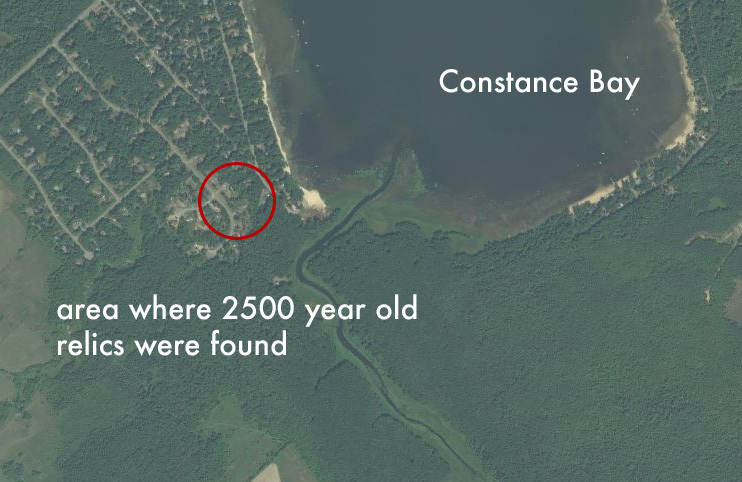 Our ancient site is located at the tip of Constance Bay where it meets a small creek, only about 40km west of Ottawa. This area has been linked to other historical artifacts, such as bayonets and cannons from the 17th century along with other post-contact native artifacts. 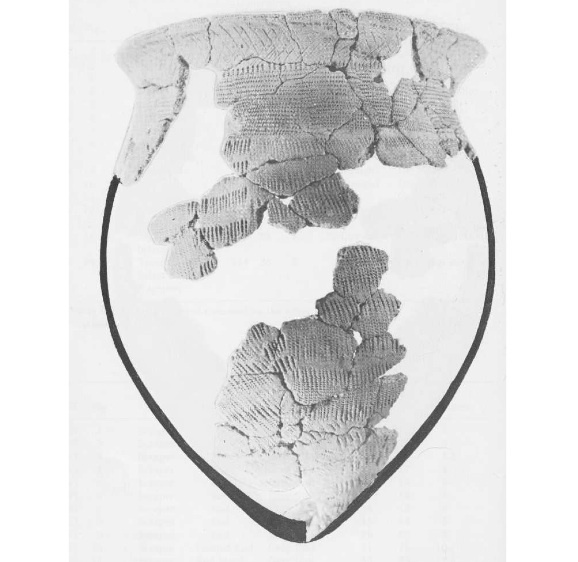 Located a few metres from the sandy beach area of the bay, archeologists in 1970 surveyed and studied the site, noting hundreds of relics that were found in the vicinity of the camp, including shards of marked pottery that were used to recreate how an archaic vessel, over 2500 years old, would have looked. Pottery fragments from a 2,500 year old vessel found in 1970. Of particular interest, a petrofrom, or an arrangement of stones that denote a special use area, was also uncovered. Speculation that is may have been part of a burial ritual was substantiated by the discovery of mica dust and red ochre, sprinkled over the buried dead and the remains of organic material in the area. This mysterious stone formation and the ancient site has since been subject to development and remains once again lost in time. 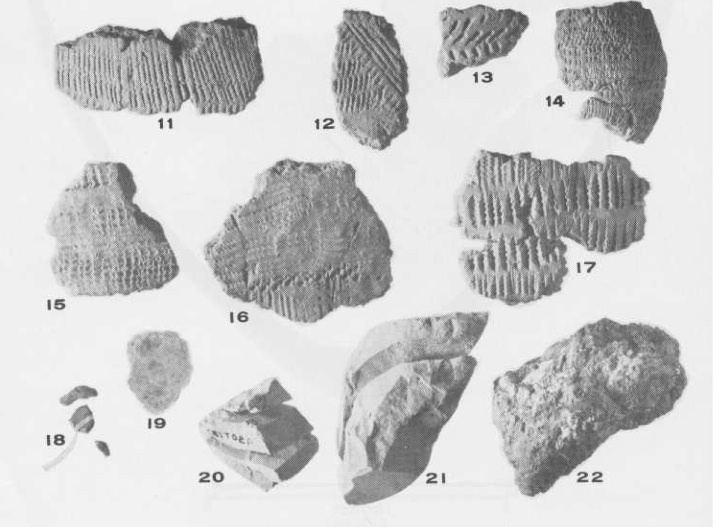 An ancient petroform, or formation of stones, was uncovered at Constance Bay in 1970. I drove out to visit the site and was met by cottages and monster homes that cover the area where the 2,500 year old site would have been. Discovered only 45 years ago, the site seems to be lost once again into the depths of time, without any plaque or indication of the fascinating history that once occurred there. Do more of these ancient sites exist in the area? Perhaps there are more mysterious stone formations and relics waiting to be found in the woods and shorelines of the Ottawa Valley, secrets to an ancient past that may someday be uncovered in our own backyards. The ancient site area as it looked in 2013. 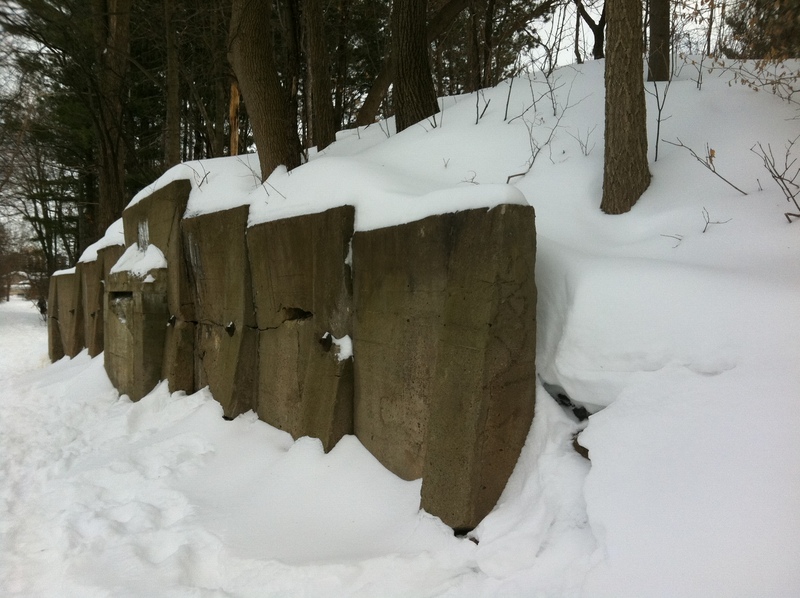 A mysterious concrete structure lies in the woods of Vanier. There is an interesting video on YouTube filmed by someone who goes by the name of “Bloeski’s Wrecking Crew” who inserted a video camera into an unusual concrete structure dated “1944” in Vanier. 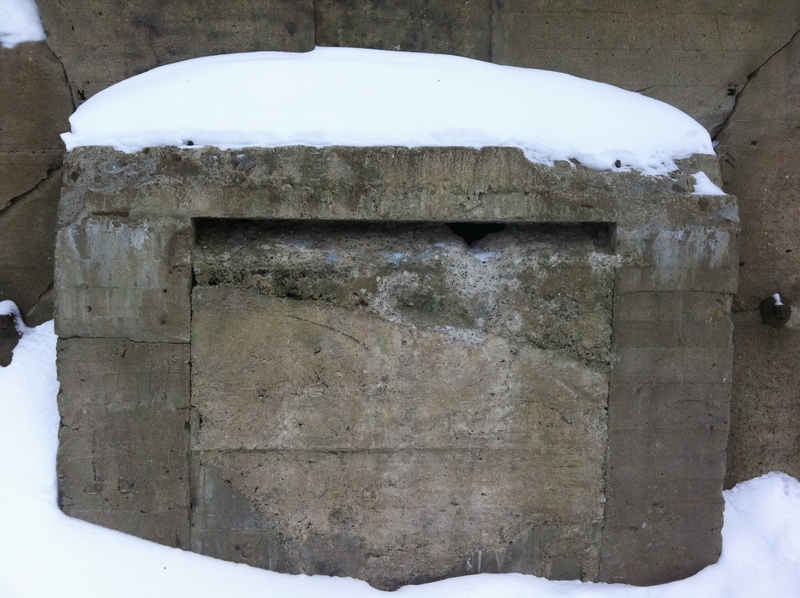 The video explores inside this odd “bunker” located in the woods of Richelieu Park in Vanier. It shows a mound with a concrete wall and sealed off entrance to what looks like some kind of military bunker. The video captures what’s inside and shows a vast room with pillars and other structures but there is no definitive answer as to what the structure was. You can view this video on Youtube here. Having seen the video back in the fall, I finally got the chance to visit the structure in person and check it out and see what it could possibly be. Here is what I found. The structure is located in Richelieu Park in Vanier and is easily accessible. The area is well used by dog walkers and a walking trail runs directly in front of the “bunker”. 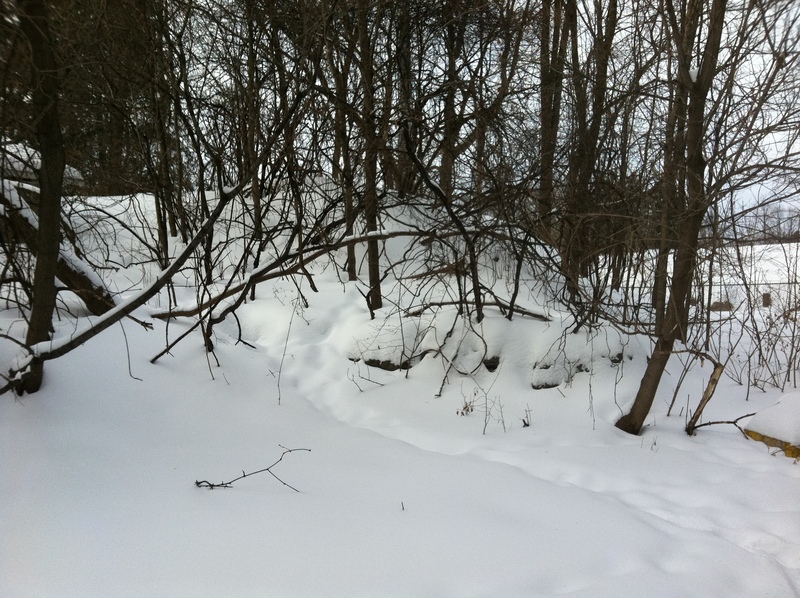 A buttressed concrete wall about 40-60ft in length runs along the north face of a 12 foot high mound. 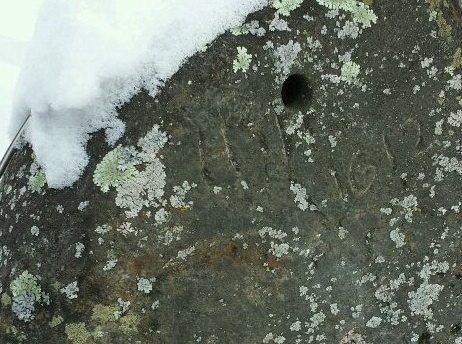 There is an entrance portal with an eroded date marked “1944” that only became visible when snow was rubbed across the surface of the inscription. 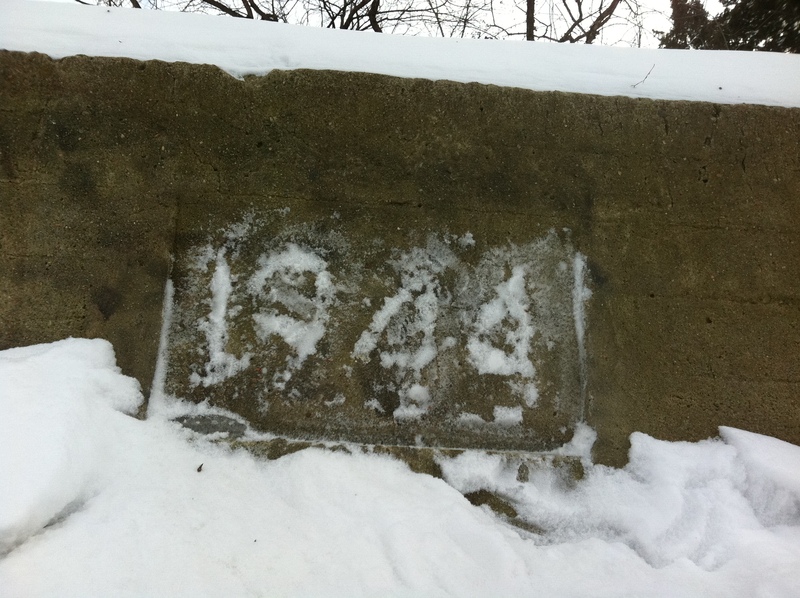 A date of “1944” became visible when snow was rubbed across an inscription above the sealed entrance. The concrete walls are decaying and there are iron support tie-rods visible along the wall. A small crevice has been chipped away by curious onlookers but nothing is visible without inserting a lit camera into the room. Again, check out the YouTube video to see what is inside this mysterious chamber. There is a 12 foot high mound surrounding the concrete wall. The mound surrounding the entrance seems to be about 50-60 feet square in dimensions and is approximately 12 ft in height. 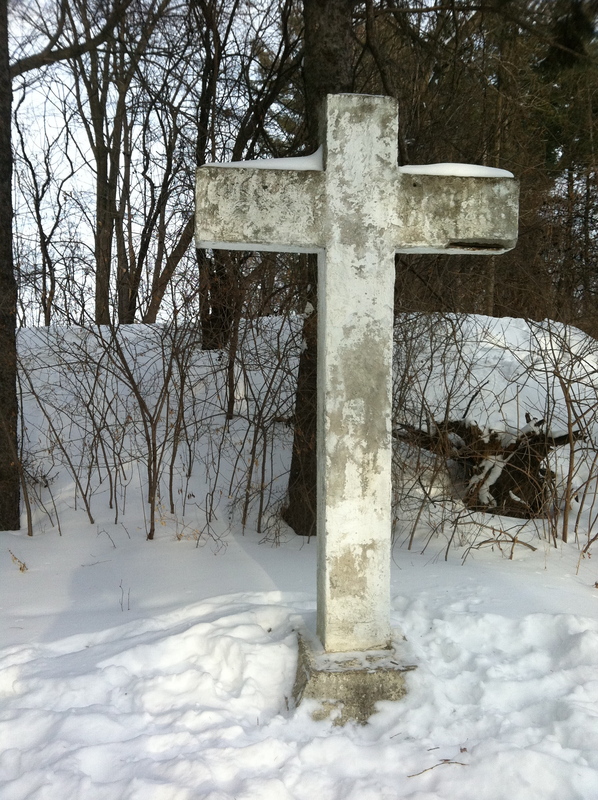 A cement cross is also located at the southeast corner of the mound. A cement cross sits on the southeast corner of the mystery mound. A nearby fence separates the bunker from Beechwood Cemetery, and Beechwood Cemetery is the site of the National Military Cemetery of the Canadian Forces, purchased by the Department of National Defence in 1944 for interment of veterans of the Canadian Forces. Was it possibly be a crypt or mausoleum used by the cemetery during the 1944 time period, and has since been abandoned? A clue found on a plaque mounted on a building near the bunker. Further exploration of the property reveals that the area was once used by the missionary society known as “White Fathers” , a Roman Catholic Society of Apostolic Life founded in 1868. They used the property to train missionaries headed to Africa and built a number of structures on the property including North America’s only operating urban maple sugar shack. (this will be working in the spring!). 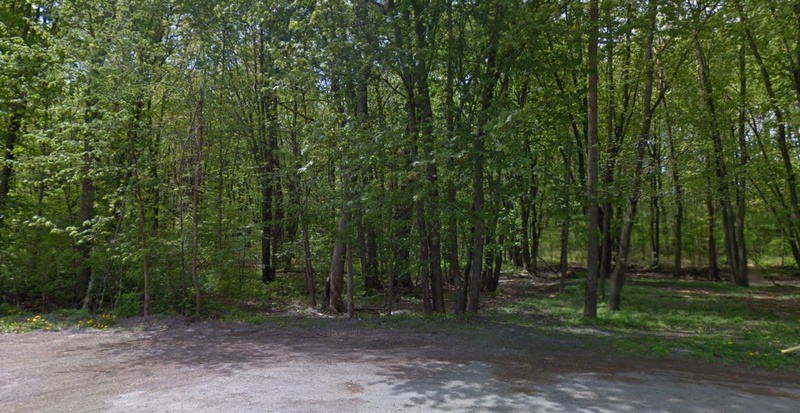 They owned the land from 1938-1976 and it is now owned and operated by the City Of Ottawa. 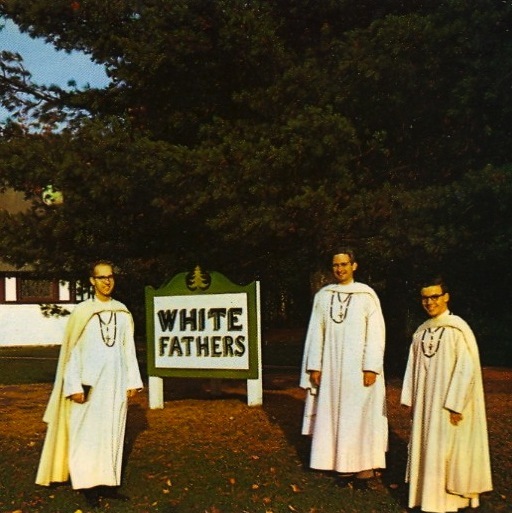 These White Fathers were missionaries whose outfits resembled the white robes of the Algerian Arabs and consists of a cassock, and burnous. A rosary and cross are worn around the neck in imitation of the mesbaha of the marabou. So there you have it. A Missionary root cellar. I guess you could say they did it Missionary style. It is an unusual structure and an interesting piece of Ottawa history that is definitely worth checking out if you happen to be out in Vanier. Driving aimlessly along country roads you never know what you will come across, and earlier this week while looking for visiting snowy owls, we came across something that seemed worthy of investigation. A lone government sign in a farmer’s field north of Richmond, simply labeled “Area 9” with a locked gate to a long abandoned road. 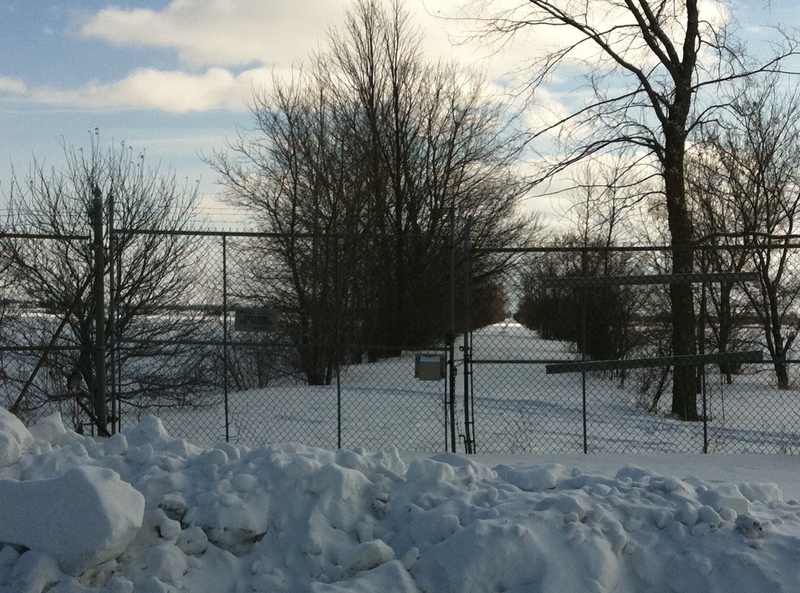 An abandoned road into Area 9 with a locked barbed wire encrusted gate sits north of Richmond, On. 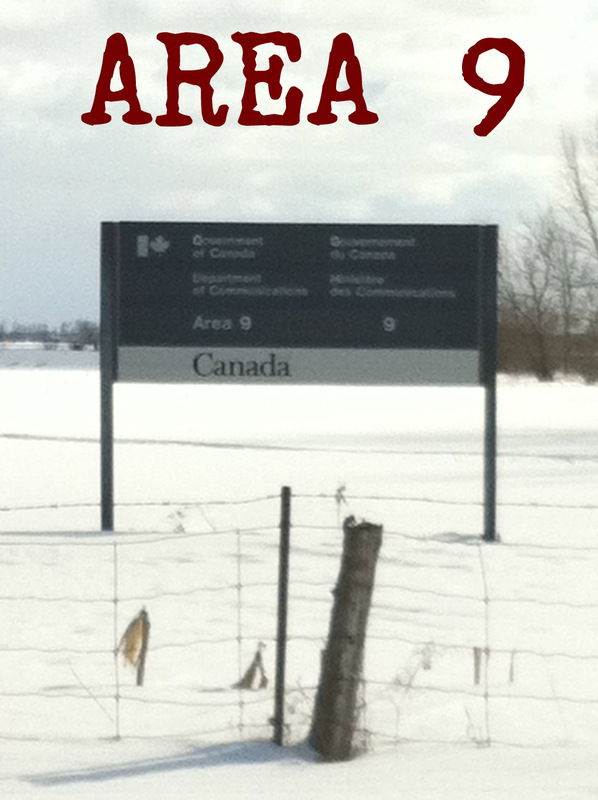 An internet search of the sign that was marked “Department Of Communications – Area 9” lead to a website explaining that the Department Of Communications was established by the Department of Communications Act in 1969 and was “responsible for fostering the orderly operation and development of communications in Canada, the powers and functions of the minister extended to telecom, national communications policy, broadcasting policy, radio and radar research, and actions necessary to secure the international rights of Canada in communications.” It was also responsible for satellite communications and supporting the Canadian space industry. Departmental restructuring in 1993 eliminated the department as a government entity and absorbed into other government departments in 1993. 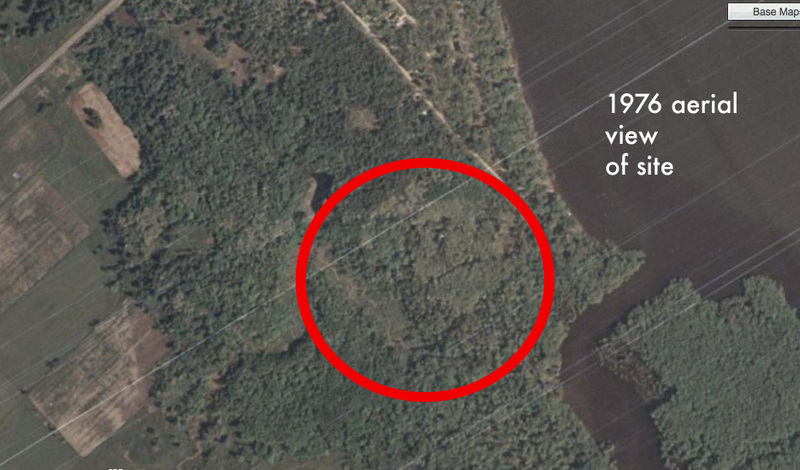 Likely part of some radio transmitter or receiver site, further searches for Area 9 info provided no results so a question was presented to my trusty Twitter followers to see if they knew anything about “Area 9”. Remarkably, the answer came in quickly and with interesting results. One person provided me with an aerial map from 1976 and 1993 showing the facility. A building, an “X” pattern and some equipment were clearly visible. But what was all this for? 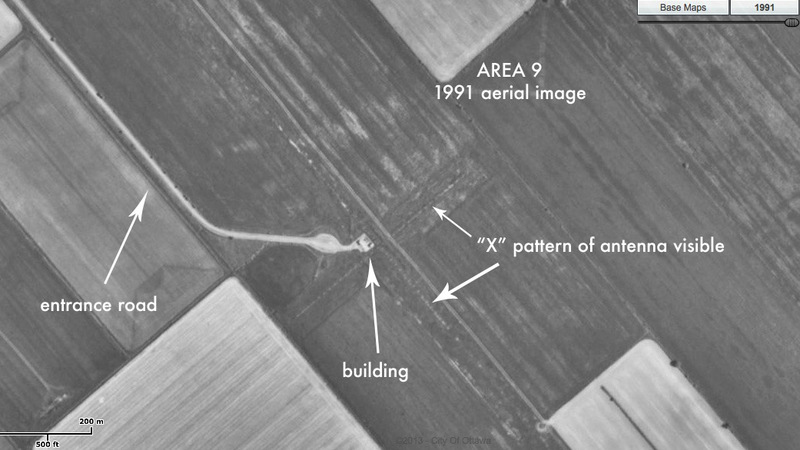 A 1991 aerial image showing Area 9 and what was there at the time. 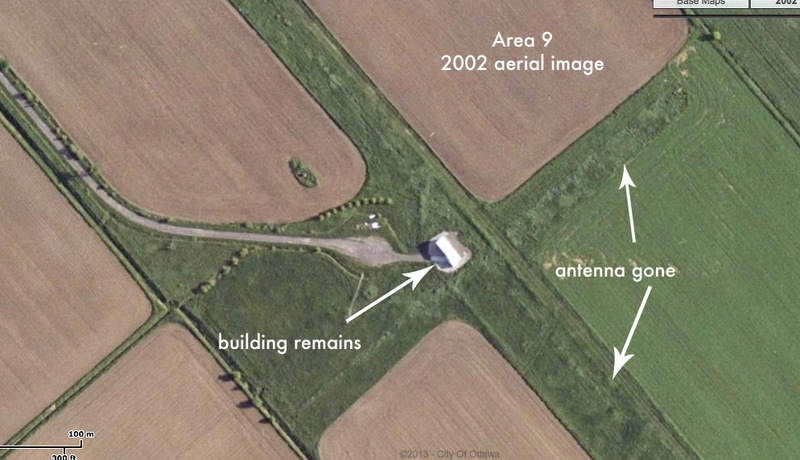 A 2002 aerial image shows that Area 9 has changed with farm fields taking over. A concept sketch showing how Area 9 may have looked when in operation overtop the area as it looks today. A Cold War radio transmission interception facility. With all the embassies located in the Nation’s Capital it makes sense our government during the Cold War was doing their best to monitor radio activity being transmitted out of them and back to their home countries. Likely in operation from 1969 when the department was formed, until the Department Of Communications was disbanded in 1993, it represents an era of espionage that has since evolved into more advanced technologies. Aerial photos show the facility still standing in 2002 but removed in 2008 with only the outlines of the previous buildings and antennae remaining today. A recent aerial image of how Area 9 looks today. A ghost of Ottawa’s Cold War past, currently owned by Industry Canada, Area 9 now sits empty, receiving only the calls of visiting snowy owls. Special thanks to Shawn Hooper, Brad Clarke, and Jim “LumberBarons”. A new look at a 400 year old mystery. 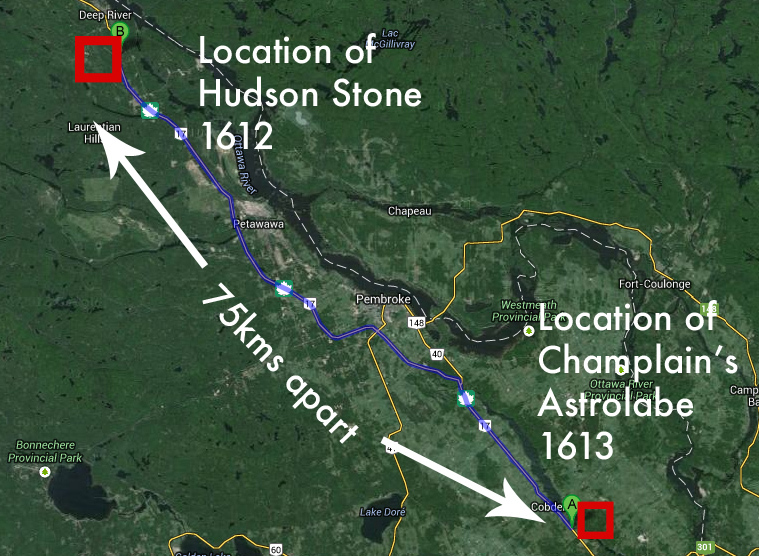 Only 75kms away from where Champlain apparently lost his astrolabe in 1613, in the town of Chalk River, ON, there is a rock with carved markings that read “HH Captive 1612”. Found in 1959 when a road worker re-paving Highway 17 came across it, this stone could help solve the mystery of what happened to the famous explorer Henry Hudson after his crew sent him adrift from his ship in a 1611 mutiny on James Bay. Does the carved “HH” represent “Henry Hudson”, held captive, a note left for someone to find and help him escape? Towns, bridges, rivers, bays, and retail stores are all named after him but he remains a mystery, a character lost in time with no final resting place as a landmark like the many places that display his name. The intrepid explorer Henry Hudson vanished into history, his legacy fading into the Canadian wilderness, but now there may be an answer. On June 23, 1611, in an attempt to find the Northwest Passage, a mutiny aboard his ship Discovery left Henry Hudson adrift on what is now Hudson Bay, never to be heard from again. Before his mysterious disappearance this famous British explorer entered what is now New York state’s Hudson River in 1609, with the river being named after him in 1900. He founded Manhattan for the Dutch who he was employed by at the time. Entering New York City harbour, Hudson sailed 240 kilometres north on what the Native Americans called Muhheakantuck, now the Hudson River, exploring its shores all the way up to what is now Albany, NY. 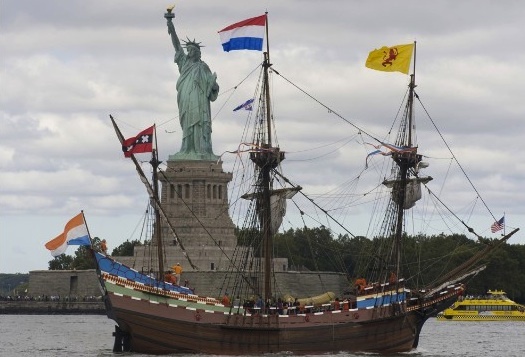 A replica of Henry Hudson’s 1609 ship “Half Moon” sails into New York City harbour during 2009 celebrations. Also named after him is the huge saltwater bay, Hudson Bay, bordered by the provinces of Quebec, Ontario, Manitoba and Nunavut. The second-largest bay in the world, the bay connects to the Atlantic Ocean via the Hudson Strait, also named after him. The Hudson’s Bay Company, the oldest commercial corporation in North America (in continuous operation for over 340 years) and one of the oldest in the world, also carries the explorer’s name. A large toll bridge that connects Manhattan to the Bronx in New York City, the Henry Hudson Bridge was opened in 1936 near the site that Hudson first dropped anchor in 1609. The quaint tourist town of Hudson, NY is also named after Captain Hudson. Obviously this is someone of great importance to have so many prominent, historical landmarks named in his honour. But why has nobody ever tried to find out what happened to him? A few books have been published about the disappearance of Henry Hudson, with many speculations made about his death. Some say he was murdered on his ship and cast overboard by his mutinous crew, others say he was sent off his ship with his son and 7 others in a small boat only to die floating across the icy arctic waters. Another story states that Hudson, his son and the 7 crew members loyal to him made it to shore and joined a group of area natives where they lived out the rest of their lives. Other legends have Hudson sailing back to Britain, or joining a native tribe, fathering children with a a female tribe member and living out his days happily as a family man in the Canadian wilderness. A startling clue discovered only a two hour drive west of Ottawa may now help trace what really happened to Henry Hudson. Henry Hudson’s map showing his 1610 arctic journey into Hudson’s Bay. In hopes of finding the Northwest Passage to the Orient, and with the backing of the Virginia Company and the British East India Company under the English flag, Hudson took the helm of his new ship, the Discovery in April 1610. A 70 ton ship that was to sail across the North Atlantic with a crew of 22 men, including his teenage son. Departing England in April, Hudson arrived in Iceland on May 11 where he continued towards the south of Greenland rounding the southern tip in June. Hudson’s cartography skills were very accurate as his his map of the voyage (scale notwithstanding) compares well to a present day Google map of the area. 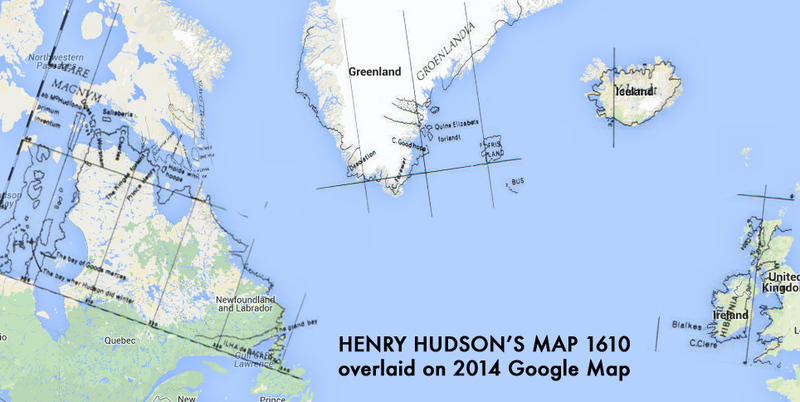 Hudson’s quite accurate 1610 map overlaid on a current Google map of the same areas. Henry Hudson entered Hudson Bay in August 1610 and continued along the eastern coast of the bay entering what is now James Bay. In a desperate search for the legendary passage to the Orient, Hudson zigzagged his way through James Bay in hopes of discovering the fabled passage. The icy grasp of the Arctic was soon to take hold of the Discovery and its crew. 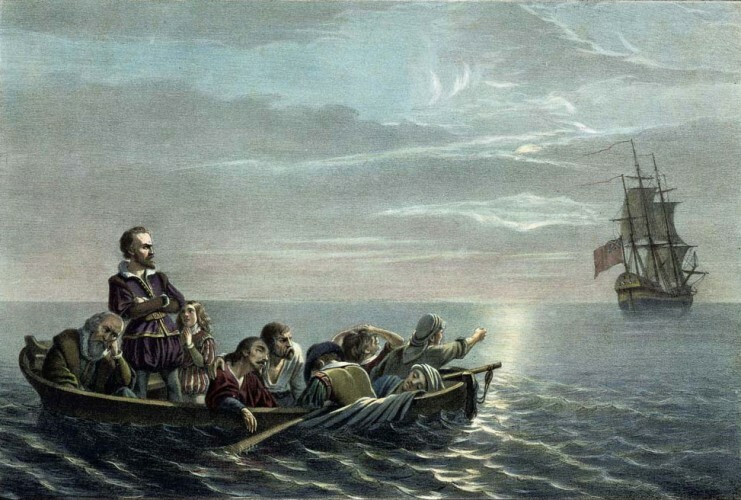 On November 1, 1610, the Discovery sailed close to shore but by November 10 they were frozen in. With only enough supplies to last the winter, there was not enough to get them back to England. 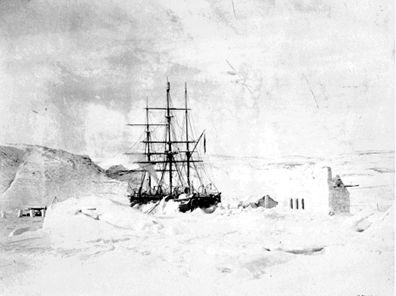 Hudson’s ship “Discovery” trapped in James Bay ice November 1610. Hudson started rationing food which started a division between the crew that was the beginning of the end for Hudson. Hudson had a difficult time keeping order among his surly, sick, cold crew. With scurvy affecting many, members of the expedition began to die and resentment towards the determined Captain grew. A plan to mutiny was formed and when the winter ended and the ship was free from the winter ice, they began the voyage home. The voyage did not get far before the mutiny occurred. Hudson was ambushed, along with his son, the ship’s carpenter and those loyal to him. The ship’s shallop (a 20-30 foot boat with oars and a sail) was brought alongside the Discovery and the nine rope-bound men were loaded aboard the small boat with supplies, food, tools and blankets. A depiction of the mutiny by Francis Davignon. The Discovery’s turncoat crew released the shallop’s rope, setting Hudson and the 8 men adrift and the Discovery sailed away back to England. The famous explorer and his companions were never heard from again. No trace of Hudson or the 8 men have been ever been found to this day. Now let’s look at some facts about the situation before we settle on the theory that he just died and vanished into the icy waters of James Bay like the history books tell us. – Henry Hudson was an experienced sailor, explorer and cartographer who had successfully completed four arduous voyages to the New World. – Hudson was determined, tough and not one to give up. – Hudson had with him a carpenter aboard a boat equipped with oars and most likely a sail with supplies and equipment. A typical early 1600’s shallop, equipped with sail and oars. 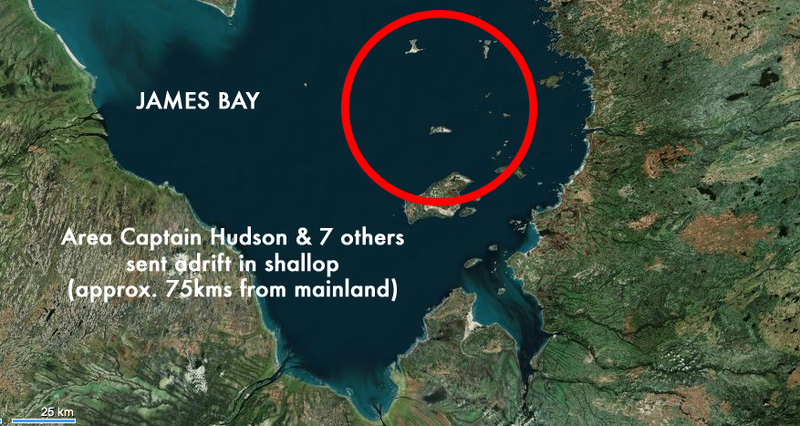 – Hudson and crew were at MOST 75kms from the shore of James Bay when they were released in the shallop from Discovery. Area where and Hudson was sent adrift in June 1611. – It was June 23 when he was set adrift. The summer was just beginning. A recent book called “God’s Mercies: Rivalry, Betrayal and the Dream of Discovery”, has author Douglas Hunter describing how another famous explorer, Samuel De Champlain, found out that some Algonquins had enslaved an English youth. Champlain made his first trip up the Ottawa River in June 1613. Champlain travelled with Nicholas de Vignau, a man who had lived with the Algonquin people on the Upper Ottawa. Vignau told Champlain that he had visited the “Northern Sea,” or Hudson Bay/James Bay. Henry Hudson was there just TWO YEARS EARLIER. Champlain now was on the Ottawa River, hoping to visit this northern sea himself, the very sea that Hudson was trying to escape from. 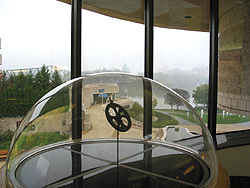 Champlain’s astrolabe he allegedly dropped near Cobden, On in 1613 on his journey up the Ottawa River. Now let’s take all those details mentioned above into consideration for a moment. What if Hudson and his men after being sent adrift pulled themselves together and rowed and/or sailed their shallop the 75kms to the shore of James Bay? A “shallop” is a 20-30 vessel equipped with oars and a sail. In fact, in 1608, Captain John Smith and fourteen English colonists set out from Jamestown in a 30-foot shallop to explore and map the Chesapeake Bay. They traveled over 1,700 miles in three months. Hudson and his crew were cast off from Discovery in an identical type of boat. They were released in their equipped shallop near the tip of James Bay, close to a number of rivers that enter the area, most notably the Harricana River. This 533km long river was first used by the Algonquins as a river route and its name originates from the Algonquin word Nanikana, meaning “the main way”. The Algonquins also use the name Inikana, meaning “river route”. A segment of the river was called Wajaha Sibi, which means “river to the bay”…James Bay. Now let’s say Hudson makes his way to the Harricana River and continues south on it. It’s summer, they have some equipment and a carpenter to fashion shelters, hunt for food and survive during the warm months of summer. Completely feasible the shallop could make its way south along the Harricana River. Now it is a fact this river is also used by the Algonquins who use it as a “main way” and a “river to the bay” as previously mentioned. What if Hudson and his men are captured by the Algonquins and taken south through the Harricana River system, over a 10km portage at Lac Mourier where the Harricana begins/ends and connects to Lac Simard where the Ottawa River begins/ends? Now on the Ottawa River, Hudson and whoever has survived along with him are traveling south with the Algonquins. Word spreads that “white men” (remember how Samuel De Champlain found out that some Algonquins had enslaved an English youth?) are captive and are making their way south along the Ottawa River. Hudson, now captive, a year after his being abandoned in the shallop in 1611, has arrived near Deep River in 1612 with the Algonquins. The timeline makes sense. Traveling the Harricana River from James Bay down the Ottawa River to Deep River would most likely take a few months putting Hudson into 1612. 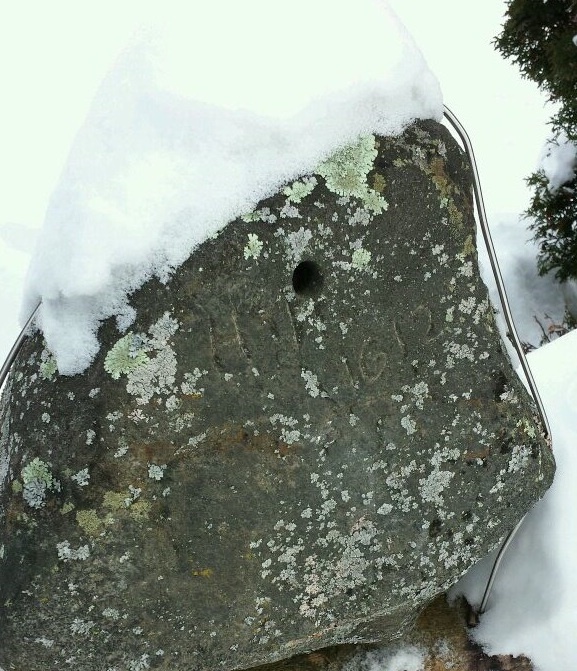 In a desperate attempt to signal any possible rescuers of his dire situation he carves into a rock “HH 1612 CAPTIVE”, which remained there until it was discovered in 1959. Samuel Champlain is making his way north up the Ottawa River at about the same time, allegedly dropping his astrolabe only a mere 75kms south of the Hudson Stone in 1613. Did these two famous explorers unknowingly cross paths traveling in opposite directions along the Ottawa River? Hudson in Deep River, captive with the Algonquins in 1612, and Champlain there just a few months later in roughly the same place? 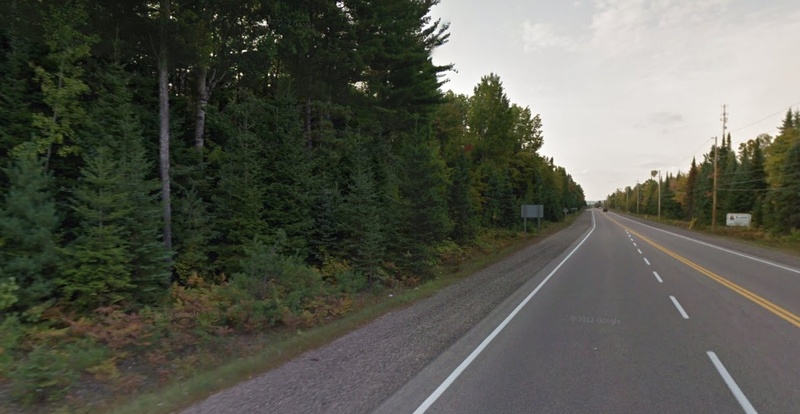 Approximate area where the Hudson Stone was recovered during re-paving of Highway 17 in 1959. Perhaps by the time Champlain heard that the Algonquins had enslaved an English youth (most likely Hudson’s teenage son), Henry Hudson was dead, since Champlain was exploring the Ottawa River in 1613, and Hudson’s desperate carving was made a year earlier in 1612. Did the Algonquins kill him or did he die of illness after the carving was made in 1612 with only his son surviving out of the 9 men originally set adrift? 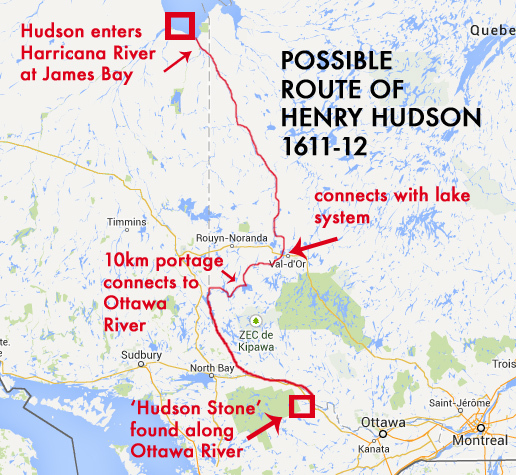 Perhaps the remains of Henry Hudson lie buried somewhere between his carved message in Chalk River and Ottawa, narrowly missed by Champlain on his route in the other direction trying to find the northern sea where Hudson had originally started his fateful journey. Two famous explorers crossing paths, one trying to escape the cold, icy of waters of the arctic, the other trying to find it. We may never know what really happened to Henry Hudson, his son or his loyal crew, and until we study the Hudson Stone in greater detail, we can only imagine how the final days played out for the explorer whose name adorns some of North America’s most notable landmarks.